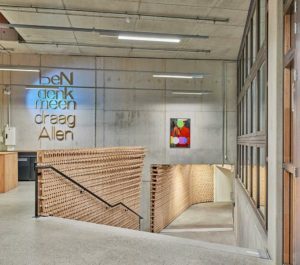 Disruptive innovation brings us sustainability – the Circular Experience is an expressive and circular interior, designed and realized by Studio RAP for the ABN AMRO Circular Pavilion. 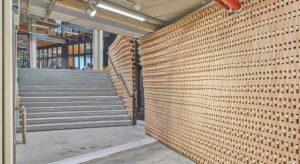 The design comprises a balustrade and wall and was built completely by an industrial robot from thousands of unique wooden battens. 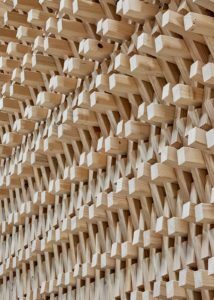 The interior is entirely made from waste wood, derived from the manufacturing of the pavilion’s laminated load-bearing structure. To make sure that repurposing or recycling is possible, the classic dowel connection is used in combination with post-tensioned steel cables. After use, the whole construction can be taken apart by removing just a couple of bolts. 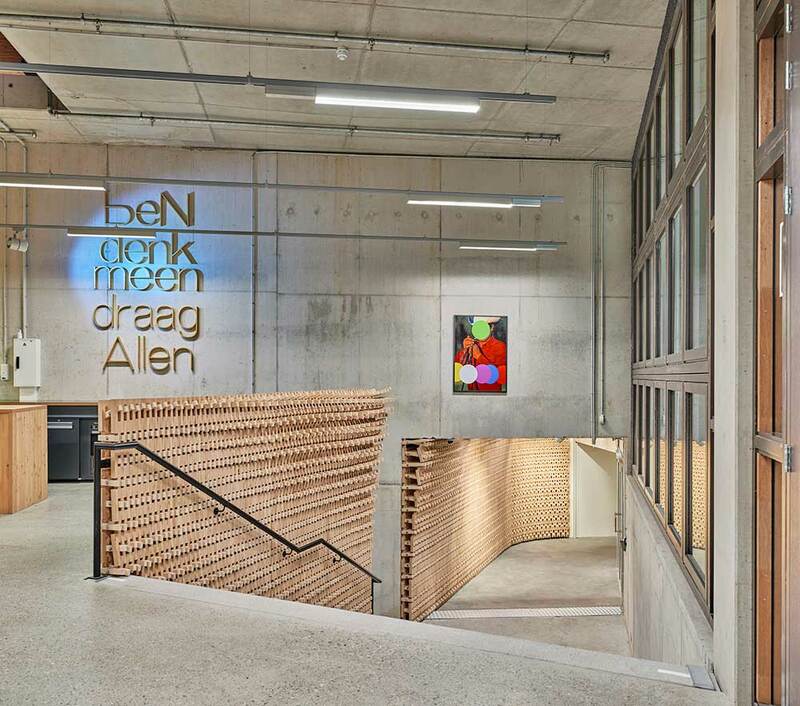 In that way, the concept and execution of the expressive design aligned perfectly with ABN AMRO’s ambition for circular building processes. Variation in multiple design variables generates a complex ornament that can only originate from the merging of parametric design and robotic manufacturing. The shape and rhythm of the balustrade are related to the position of the handrail. The pattern is closed and flush close-by but opens up and differentiates itself when it gets further from it. 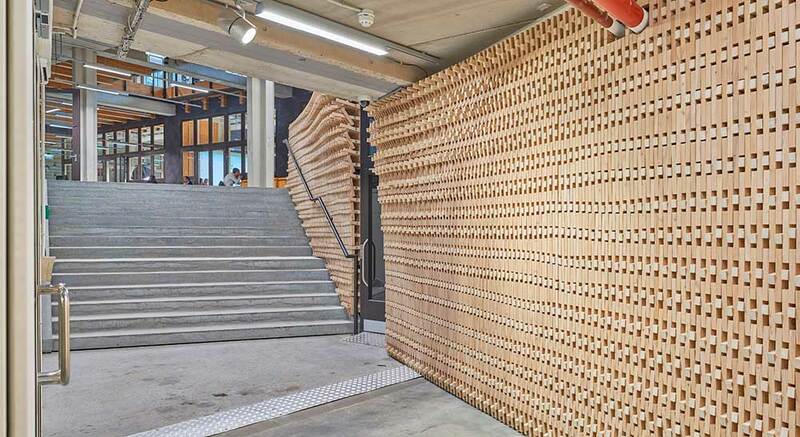 Using this simple logic, 10.000 unique wooden elements connected by 50.000 unique dowel positions were transformed automatically into expressive and sustainable interior elements. Profitable innovation is the most important factor for sustainable development in architecture and the construction industry. 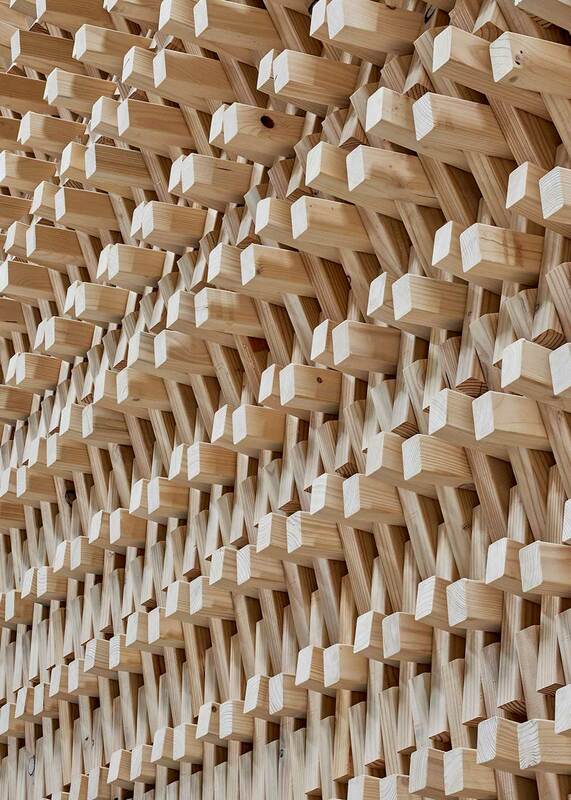 Studio RAP are researching and applying the potential of digital design and digital fabrication on every project they undertake. As architects, they believe in their power to deliver a substantial contribution to society by transforming the fragmented, one-dimensional building process into a digitally-integrated building process. A process where smarter, tailor-made buildings are produced efficiently. But this means the role of the contemporary architect must be reconsidered towards that of a digital master builder; one who utilizes the untapped potential of digitization, automation and digital fabrication for more expressive and efficient building design. Studio RAP believes in digital fabrication, especially robotics, as the enabler to close the gap between the possibilities of the digital and the material world. This reunification results in a more straightforward building process where experts can work together, simultaneously, on solutions for a building’s total lifecycle; resulting in a circular construction industry. It ultimately revolutionizes the entire building process. The design and robotic fabrication of the Circular Experience explains this ideology.